I’ve only had one experience being near a helicopter. One warm December day when I was a kid my mom took me to the field behind the village hall. There was already a crowd of parents and kids waiting there when we arrived. We stood around for a while and I was wondering what the deal was. Then a helicopter appeared overhead and slowly came down to land. As it came down we could all see that Santa Claus was the passenger. He waved his big white glove at us as they landed. Santa got out of the running copter, handed out a bunch of candy and then hopped back in and left. It was over in mere moments. It was quite an exciting time for a young boy. Oh. Damn. I meant, a bit like the *pissed off face*-smiley. D: It’ll take years to grow them again! haha thats great.. it took me a while cause i was looking at the brows in his hand and didn’t look up to see biff’s best feature missing. Oh noes! What’ll biff do without them!! D: ..Maybe he could glue them back on? use dust tape! duct tape fixes everything! Knowing Biff, I’d put my money on him attempting to weld them. or supergluing them to his mouth accidentally. wow. That’s your only experience with helicopters? I’m only 15, and I’ve been on a helicopter already. Specially since we got to play with the microphone thingies in the earphones. Hehe. Noooooooo! Not the eyebrows! How will he balance himself now? It’s like a cat losing it’s tail. He… he lost his eyebrows?! It’s actually like taking off a cats whiskers, and biff looks ALMOST normal without them. I wouldn’t worry about it, he’ll probably buy a hair growth formula on a commercial at 3 in the morning. Aw. . . I can’t call him ‘Super Brow’ now. I think that knowing biff he tried to use his eyebrows as helicoptor blades, but they got stuck in something and came off. I’m guessing he’ll mysteriously have them back tomorrow, no explanation. Just like in the first comic, when half his head was chopped off and he was back to normal the next day. Oh no! Biff just isn’t Biff without his eyebrows! At least hes still got his long mouth. Is it just me or has Biffs enormous mouth shrunk as this comic progressed? yea…. his mouth has shrunken alot… thats friggen crazy!!!! OH MY GOD! Biff lost his eyebrows! It’s a sign of the apocalypse! Quick! To the bunker! Reminds me of an early scene from George Romero’s “Dawn of the Dead”… …you know the film… …it takes place mostly in a shopping-mall? “When There’s No More Room In Hell, The Dead shall Walk The Earth”. 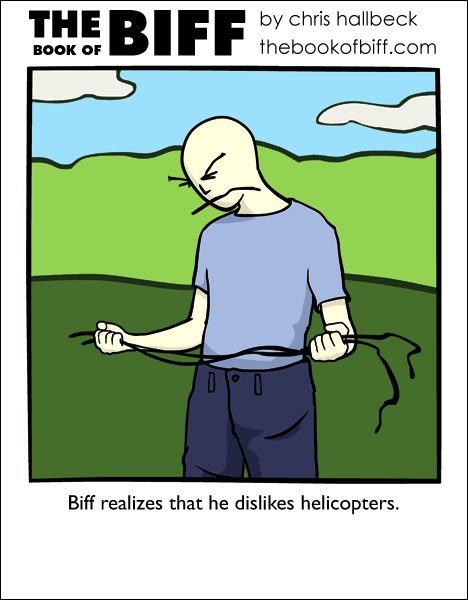 Anyways, a zombie carelessly gets close enuf to a helicopter to get it’s head sliced off – much like Biff#1, in fact. I went in a ‘copter once, and they’re allways flying over my house for some reason. I can’t say what i think the reason is, because if i do, i’ll myseriously vanish overnight. Nate: You’re supposed to do something IN a helicopter, not WITH one. Otherwise…eeeewwwwww. HELICOPTERS ARE EVIL I SAY! My last experience of a helicopter was working on a roof at a military base and a few large navy copters came in low. I remember thinking that “oh crap, lots of little bits of loose tin are going to hurt” and then very hurridly fixing down any loose sheets. Thankfully they turned just before us. wouldn’t the downward air pressure cause his ‘brows to sag, or does he like them nice and starchy? No, it’s duct tape that fixes everything. Did you just draw this to get away with drawing the giant brows again?! huh?! didja?! I joke, obviously, my little friend who isn’t little, or my friend, for that matter….